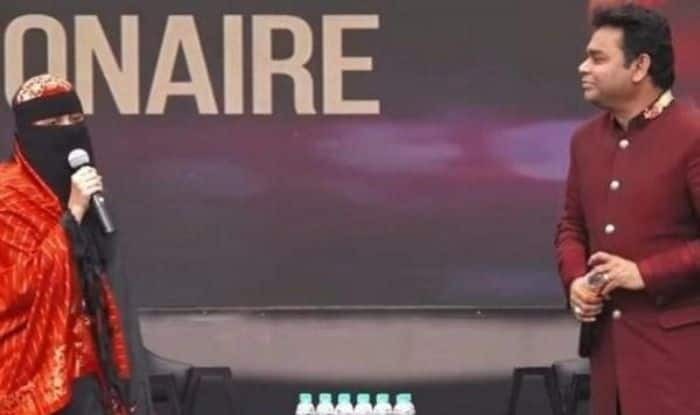 AR Rahman who has been making India proud by bagging two Oscars for his work in Slumdog Millionaire was recently trolled by netizens after a video of his daughter Khatija Rahman, interviewed him on stage with a niqab on. Recently, AR Rahman, Anil Kapoor and Gulzar attended the 10-year celebration of Oscar-winning film Slumdog Millionaire in Mumbai. At the event, Rahman’s daughter Khatija delivered an emotional speech and the video soon went viral. What came after was a shock since netizens starting trolling Ramhan for “forcing” his daughter to wear a niqab. Khatija was applauded for her heart-touching speech but what caught the attention of many was her veil. Her father was targetted and was called a hypocrite for ‘forcing’ his daughter to wear a niqab. Rahman, who is known for his calm and composed nature, did not react to it in a bizarre way, instead he chose to simply share a picture of himself with his daughter and the other important women in his life and wrote, “The precious ladies of my family Khatija, Raheema and Sairaa with NitaAmbaniji #freedomtochoose.” The last hashtag was enough to shut all the trolls that attacked him. Khatija also came in support of her father and shared a post on Facebook that read, “I’m a sane mature adult who knows to make my choices in life. Any human being has a choice to wear or do what he/she wants and that’s what I’ve been doing. Hence, kindly don’t make your own judgements without understanding the exact situation #freedomofchoice. (sic)”. “The recent conversation of myself on stage with my dad has been doing the rounds although I didn’t expect such an overwhelming response. However, there were certain comments which said that this attire is being forced by my dad and that he has double standards. I would like to say that the attire I wear or the choices I make in my life does not have anything to do with my parents. The veil has been my personal choice with complete acceptance and honour. (sic),” she added. At the event, Khatija spoke about how she is proud of her father and he is still a humble man even after receiving Oscars.